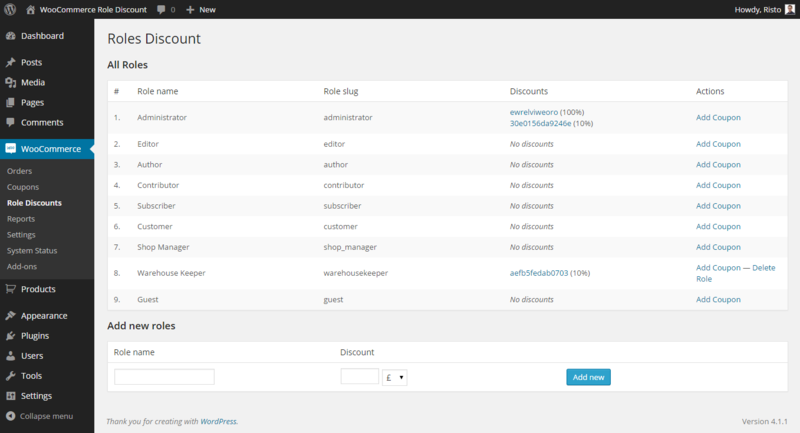 Before this plugin, there wasn’t any possible way to create multiple discounts for different user roles. With this plugin, you can take advantage of WooCommerce`s built-in Coupons system and WordPress` User Roles. Add as many custom roles as you want and create discounts for them. As this is based on WooCommerce`s Coupons system, you can simply use all of the coupons system to manage it for every role. As of version 2.0, you can also add custom prices for each role separately. This plugin is in English, but is also translated into Estonian and supports any other language as well! Fully compatible with WordPress 4.9.x and WooCommerce 3.4! Log in. If products are added to your cart, then you will have a 10% discount (as seen in the screenshots). Fix: bug when managing coupon roles and not saved when no roles selected. 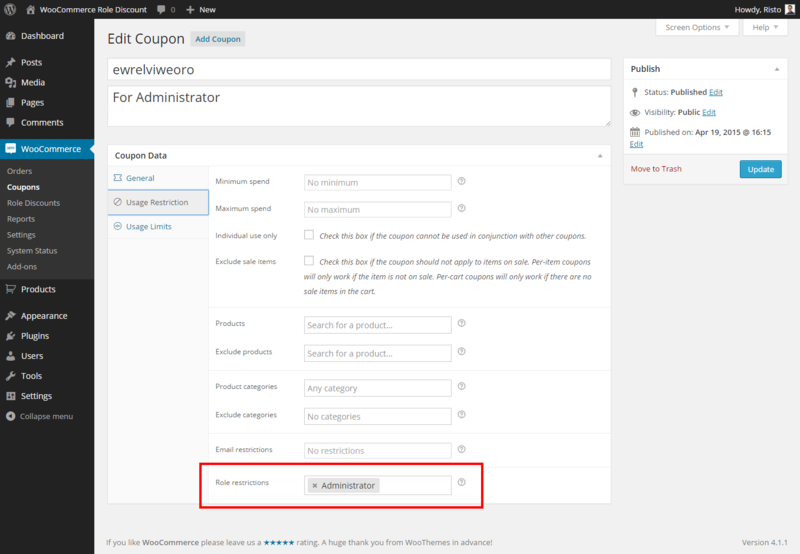 Feature: Coupon option whether to apply coupon automatically to user cart. 2.0.1 - Fixed bug when manually created coupons would not be approved for adding. Also "coupon applied" message is not removed when it is not WCRD coupon. 2.0 - Rewrote the whole plugin. Now you can set completely custom prices for simple products and add multiple global discounts per role. 1.4.1 - Fixed issue when coupons are not being applied and roles not created. Checked compability with WooCommerce 2.3. 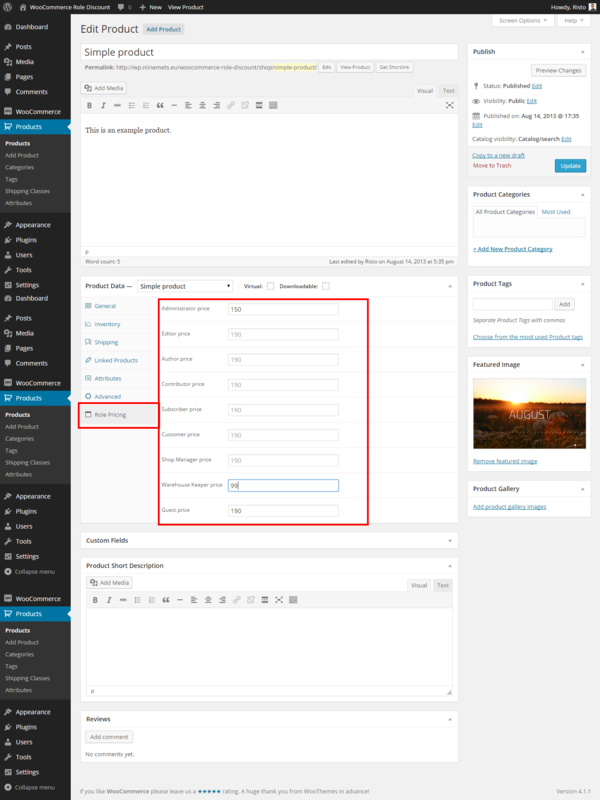 1.4 - Added compability with WordPress 4.1. Removed "Coupon applied" text appearing when a discount is applied to user - less confusing. 1.3 - Added compability with WooCommerce 2.2.x and WordPress 4.0. Added extra built-in user role "Guest", whereas you can create a discount for not logged in users. 1.2 - Hid the ugly coupon code from cart and checkout page. Added security check that other roles could not use other coupons created for roles.